Welcome to the Holiday Inn London Brentford Lock. This modern and stylish hotel is situated within the newly developed area of Brentford Lock and on the banks of the Grand Union Canal, offering unique waterside views. The Hotel offers quality accommodation, meetings and event space, providing value for money. Essential services and facilities combined with a distinctive personality and ambience, gives the Holiday Inn its top-choice rating among business and leisure travellers. Brentford train station and Boston Manor tube station are a short distance away. The hotel is also easily accessible from Heathrow and Central London. The hotel is with easy access to the M25, M4, A4 and is ideally located 6 miles west of Central London and 6 miles from Heathrow Airport. Brentford and the surrounding areas offer plenty of places to visit including Kew Gardens, Syon Park and nearby Twickenham and Richmond. Our 134 non smoking guest rooms are made for comfort and convenience and every detail is designed to create a modern and relaxing environment. Why not upgrade to an Executive room and enjoy the views of the Grand Union Canal from your balcony. All the hotel's bedrooms are fully air-conditioned, offer private bathrooms and a full range of amenities. All Advance Purchase Rates are charged prior to arrival. The credit card used to make the reservation MUST be presented upon check in. The Holiday Inn London Brentford Lock offers 134 air-conditioned spacious rooms including 18 executive rooms with balconies overlooking the Brentford Lock. All rooms offer complimentary tea and coffee, iron and board, safe, mini fridge and hairdryer. Wi-Fi and Hard Wired high speed internet access are available throughout the hotel. The Island Restaurant & Bar at the Holiday Inn Brentford Lock offer a very special dining experience, offering the delights of Pan-Asian dishes, weekday specials and Traditional Sunday Carvey. The Academy conference & training suites offer modern up to date facilities, for up to 700 people. All meeting rooms offer natural daylight, blackout and High Speed Internet Access. The Waterfront Banqueting Suite can hold weddings and events up to 600 people with stunning views of the canal. All rooms are suitable for a variety of events from training courses, boardroom meetings, conferences, weddings & team building events. Conveniently located near Heathrow and Central London, you can enjoy contemporary meeting and event facilities with unique waterside views and natural daylight. Our Academy facility is our purpose built and self-contained conference and training suite, designed to help you get the most out of your meeting. Equipped with 6 fully air conditioned meeting rooms catering from 8 boardroom style to 600 theatre style, we have a room to suit your requirements. If there is one thing that sets the mood and flavour of a party, it is the venue you choose. So if you want to make your party truly memorable look no further than the Holiday Inn London-Brentford Lock. The Holiday Inn London Brentford Lock also specialises in catering for a wide range of events from weddings, parties, gala dinners, product launches and events for up to 700 guests. We have our own private kitchen which makes our venue ideal for kosher functions as well as outside caterers. 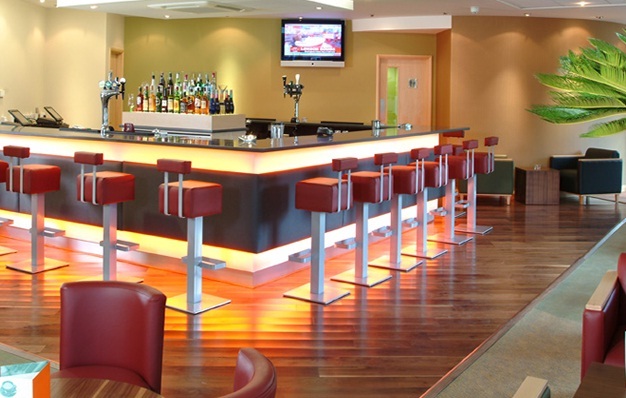 The Holiday Inn London Brentford Lock offers a choice of dining to cater for all tastes and requirements. Whether you prefer full cooked or a lighter alternative, you can start the day with the famous Holiday Inn breakfast. The Island restaurant serves traditional buffet breakfast consisting of a selection of hot and cold dishes, fruits and beverages. Full English or continental breakfast options are also available. The Island Restaurant offers the finest cuisine in modern surroundings with attentive, efficient, and friendly service. Located in the picturesque waterside setting of the Grand Union Canal, the Island restaurant offers contemporary Pan-Asian cuisine in a modern and relaxed atmosphere. There are regular “specialty nights” such as our re-known Friday night Curry and Sunday lunch Carvery which have become established favourites with the locals. SESSIONS... Bar & Grill, serves drinks, meals and snacks throughout the day. It's the perfect place for a working lunch with colleagues or to relax with friends.... WI- FI is free of charge... So whether you are on business or leisure, SESSIONS... Bar & Grill is the ideal place to socialize whilst enjoying your favourite drinks, food or Costa Coffee. 24 hours room service is offered for those who prefer to dine in the privacy of their room. Click below to view the different choices of dining available at the Holiday Inn London - Brentford Lock.